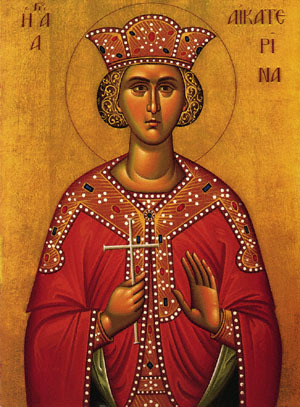 Saint Catherine, who was from Alexandria, was the daughter of Constas (or Cestus). She was an exceedingly beautiful maiden, most chaste, and illustrious in wealth, lineage, and learning. By her steadfast understanding, she utterly vanquished the passionate and unbridled soul of Maximinus, the tyrant of Alexandria; and by her eloquence, she stopped the mouths of the so-called philosophers who had been gathered to dispute with her. She was crowned with the crown of martyrdom in the year 305. Her holy relics were taken by Angels to the holy mountain of Sinai, where they were discovered many years later; the famous monastery of Saint Catherine was originally dedicated to the Holy Transfiguration of the Lord and the Burning Bush, but later was dedicated to Saint Catherine. According to the ancient usage, Saints Catherine and Mercurius were celebrated on the 24th of this month, whereas the holy Hieromartyrs Clement of Rome and Peter of Alexandria were celebrated on the 25th. The dates of the feasts of these Saints were interchanged at the request of the Church and Monastery of Mount Sinai, so that the festival of Saint Catherine, their patron, might be celebrated more festively together with the Apodosis of the Feast of the Entry of the Theotokos. The Slavic Churches, however, commemorate these Saints on their original dates. Share the feast of Catherine the Great Martyr of Alexandria with an icon greeting ecard.